Rebecca Solnit takes the topic of feminism and women issues by the horns and tells you all about it, without mincing her words. 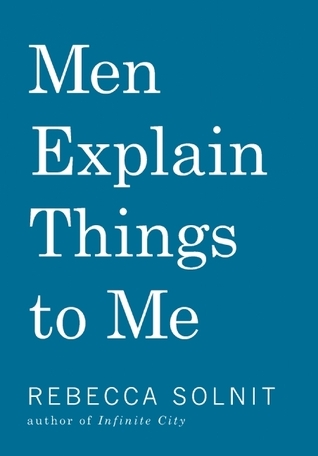 “Men Explain Things to Me” was on my bookshelf for quite some time. I was a little hesitant to read this because I thought it might be too preachy, but when I did get down to reading it, it broke all my misconceptions. “Men Explain Things to Me” is about women and men and how we all are when it comes down to the dynamics between the two. The essays in this book are thoughtful, insightful and reflections on photographs and what is going on in the world, when it comes down to violence against women and making them subversive. Women face a crueler world. They do and Solnit makes no bones about stating that. At the same time, she presents a world that is ridden with male privilege, misogyny and sexual entitlement, no matter how much we refuse to face it. That is what it is. Rebecca Solnit looks at incidents all over the world and does so with a microscopic angle. She takes into account the political, sexual and daily work perspectives as well, when talking about men and women. “Men Explain Things to Me” is quite an eye-opener about the world we live in and it is just sad that even though we know about what goes on, we sometimes turn a blind eye or think that everything is right. I cannot stop recommending this book to anyone. It is meant for us all. To realize what can be saved while we still have time and conscience. This entry was posted in Books, Haymarket Books, Non-Fiction, Review and tagged essays, feminism, feminist, Haymarket Books, Men Explain Things to Me, Non-fiction, Rebecca Solnit on January 16, 2015 by thehungryreader.